After the Ghost of Christmas Past stabs Scrooge during the first rehearsal of "A Christmas Carol," the murderer makes an escape. The list of suspects grows longer, and the women of Cackleberry Club are determined to find the killer. Sign me up to receive news about Laura Childs. This 8th book in the Cackleberry Club series sees Suzanne and Toni front and center for the murder of Allen Sharpe. Cast as Scrooge in the community play. In which both ladies are working as crew. The shady lawyer's murder takes place in plain sight of cast and crew. With the shroud covered murder barely managing to escape Suzanne after she gives chase. Though she has been more than warned to keep her sleuthing skills to herself. Suzanne finds herself drawn into the investigation as news of the murder sets tongues wagging around town. And more and more of the prime suspects find their way through the doors of the Cackleberry Club for Petra's irresistible fare. While spilling more than their fair share of coveted gossip tea as to who the elusive killer might be. This is by far one of the most enjoyable books in this series. Toni provides just the right amount of comic relief to balance out Suzanne's more practical approach to whodunit. Add in Petra's sage advice and an ever growing list of suspects and motives for the esquire's extinction. And what one gets is a cozy mystery worth its weight in hot cocoa and fuzzy socks. This is the kind of book that keeps the pages turning just out of a sheer "need to know" who, why, or what will happen next. Reviewer's Note: This 8th book in the Cackleberry Club series is one that may be read as part of its intended series or as a standalone. I received this book for review from First To Read. The ladies at the Cackleberry Club are enjoying the Christmas season when attorney Allen Sharpe, playing Scrooge in a community production is killed during rehearsal. Suzanne, co-owner of the Cackleberry Club café, Kindred's favorite combination diner, craft store and bookshop, chases the murderer out of the building but loses him in the alley. As the days pass the list of suspects grows longer. Is it the disgruntled partner? The former secretary whom Sharpe sexually harrassed? Or is it fellow owner of the Cackleberry Club, Toni's almost ex-husband, Junior? The women of the Cackleberry Club are determined to find the killer before he can add another victim to his Christmas list. This is such a great series, well written, full of humor and a plot that provides a great number of suspects, and varying reasons for the murder. The murder was unique in the fact that I don't ever remember a book where a ghost, especially the ghost of Christmas past, did the killing. Eggs on Ice is a perfect addition to this series, and I enjoyed every word of it. This is one of those keep turning pages and just one more chapter books. I can't wait for the next one in the series. I read a digital copy of this book through Penguin's First to Read program. When a local is killed during the rehearsals for A Christmas Carol no one is really surprised. The dead man, Allen Sharpe, wasn't a well liked man and everyone believed his part as Scrooge was a perfect fit. The Ghost of Christmas Past killed him although the man who was playing the part got sidetracked and someone took his place, taking the opportunity to murder. Suzanne saw it happen and chased the killer but once he threatened her she backed away. Suzanne knows that she must investigate to find out who the killer is and who it was that threatened her. The problem the man had plenty of enemies to choose from. Could it have been his business partner, or was it Toni's ex-husband, or maybe a person that he sexually harassed while working for him. The list is long but that doesn't stop Suzanne, with help from the other Cackleberry Club, from looking into things. Will she be able to find a killer or will she be the next victim. Follow along and find out!!! This is a well written series that always has a great mystery to solve. I hope that I'm as fun as these ladies are when I get to be their age. I can't wait to see what they get into next. The local town production of the Christmas Carol is in rehearsal in Kindred, Minnesota. Suzanne, co-owner of the Cackleberry Club café and her cohort, Toni are part of the stage crew. Suzanne realizes that the huge Ghost from Christmas Past is not the scripted ghost. She then realizes that the man playing Scrooge, attorney Allan Sharp has been murdered during the scene. The story has intrigue, mystery, suspense. There is quite a tangled web of clues, plenty of secrets revealed with lies uncovered. The mystery has been uniquely blended with a cast of complex, well defined, some quirky and all very interesting characters. An enjoyable Christmas mystery. This is book # 8 in the Cackleberry Club Mystery series. It can be read as a stand alone as the author weaves the past and present together effortlessly. Recipes Included. I volunteered to read Eggs on Ice. Thanks to the Penguin’s First-to-Read Program for the opportunity. My opinion is my own. My 2nd venture with a Laura Childs book, different series this time. The ladies from Cackleberry Club are on the case of find the killer. While Suzanne and Toni are at rehearsal for a play the witness one of the key members get stabbed by a "ghost". I really enjoy these little cozy murder mysteries. They give you mystery, comical moments, friendship, and romance. 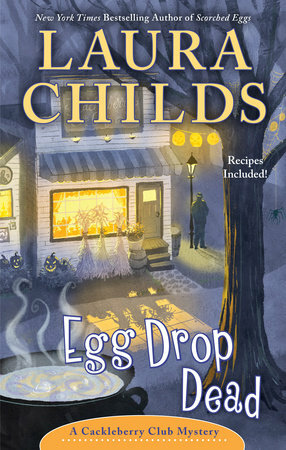 Eggs on Ice Laura Childs This is another cozy read with a lead character that has all the answers. It was an ok read, but not one I would be interested in reading again. I received this from Penguin's First to Read Program in exchange for an honest review. I received an ARC from First to Read and this is my honest opinion. I enjoyed this Christmas cozy mystery. The characters were eccentric and well-written and the mystery kept me guessing. I received an advanced copy of this book from First to Read in exchange for an honest review. This was the first book in this series. This book can be read as a stand alone, though, and I didn't feel lost without having read the other books. It was nice getting into the holiday spirit. The story was interesting and I enjoyed the characters. Will definitely be looking at reading more book by this author. It is Christmas season at Cackleberry Club Cafe. The town was getting ready for the Christmas Play, The Christmas Carol. During rehearsals, the scene with Scrooge and the ghost was playing out on stage in a very odd way. When the ghost exited, Scrooge was dead. Who killed Alan Sharp? He was playing Scrooge, but he was the most unliked man in town, so many people could have done it. The fact that the whole cast saw the murder, yet no one realized what was happening makes it even harder for Sheriff Doogie to figure out. When a second murder occurs and Junior's trailer gets torched, things just become more confusing. Suzanne is once again asked for help by Amber, the main suspect. Is she risking her own safety and that of her friends? Laura Childs is a gifted author when it comes to blending the setting and the characters into her mysteries. I would love to visit the fictional Midwestern town of Kindred in this book. This series' strength comes from the friendship between Suzanne, Toni, and Petra. Suzanne is the ringleader when it comes to detecting and running the business. Petra is the calming influence and Toni wants to party. They all work so well together in the business with each bringing a specific talent to the enterprise. Another strength is the Cackleberry Club Café itself. This is where everyone goes to meet, gossip, and dine, which allows Suzanne to gather information and ask questions. The one thing that bothers me is the men. Sheriff Doogie can't seem to figure anything out without Suzanne's help/interference, Junior is a bit of a doofus and Sam, who is a doctor, can't make a meal? I know this is a book about the women, but the men make them look bad as well. The author did a great job at keeping me guessing. Just when I thought I had it all figured out, there was a twist and I discovered I was wrong. The murder’s motive was the usual, money, yet it was barely mentioned. Overall, this was an enjoyable read, however I liked the earlier ones in the series better. I think this was the first cozy mystery I've finished. This was actually fun to read despite disliking Suzanne and all the men. None of the men knew how to take care of themselves or feed themselves (looking at you, Sam) and it generally came off as a 'silly boys! can't live with them, can't live without them!' vibe that just feels so outdated in 2018. Suzanne got on my nerves the most. She felt she was entitled to stick her nose where it didn't belong and endanger her friends because she was threatened after she initially ran after the murderer. After being told by said friends (Toni and Petra-I actually really liked them), her fiancé Sam, and the sheriff to stay out of it for her own safety, she STILL deludes herself into thinking it's her business. She also seems to have zero sense of self-preservation as she freely hints to those she suspects as the murderer that she thinks they're guilty. Such a smart lady, that Suzanne. The murderer was super obvious to me (thanks cop shows), but it didn't hinder my enjoyment of the story. The writing sort of reminded me a bit like the Sookie Stackhouse books where every single thing is described that's not relevant to the story at all (and things are always bought at JC Penney). It's probably not good writing, but I think it adds a certain sort of charm to these types of stories. The ending feels a bit rushed. I would've liked to see what happens after the murderer is arrested and the town finds out about it. Maybe in the next book? I just might stick around to see. This is a wonderful mystery to read during the holiday season. The characters are interesting and the story moves along at a good pace. It’s part of a series but it can be read as a standalone. This was a good book, I love mysteries and Christmas books so to have the two combined was fantastic. This book keeps you on your toes trying to figure out the two murders with all of the twists and turns. I have never read any of the books in the Cackleberry club series and I didn't feel lost in this book. I will definitely be reading more books in this series. I received an advanced copy of this book in exchange for a fair and honest review. This is part of the Cackleberry Club series, but you could read it as a stand-alone and not be lost while reading it (I did). This is the story of two murders in a small town, and Suzanne and her friends and the town Sheriff, Doogie, who this time seems to be in over his head with the two murders. This one has plenty of twists and turns and lots of fun and snow. I highly enjoyed this one and will be reading more from this author and this series! Good mystery, starts off with some danger that drew my interest. The main characters & support characters you can grow to like & appreciate. This is my first time reading a mystery by this author & I have no problem reading more in this series or another mystery. I tried so hard to finish this. I got a third of the way through before I skimmed the rest. While the premise was unique and interesting, the dialogue was cheesy and awkward and the characters were so one dimensional. I couldn’t get into it, and looking at the reviews, I’m not the only one. This is my last visit to the Cackleberry Club for sure. I quite liked this book. I had never read any of the Cackleberry Club mysteries, but have read other novels by Laura Childs. It was a nice cozy mystery and I was surprised by the reveal of the murderer, it actually wasn't who I expected at all. I would definitely read another book like this again, and I'll be looking for more from Laura Childs in the future. Although I have read other books by Laura Childs, I had never read a book in this series. After a slow start, I have to say that it was everything you expect a cozy mystery to be (cute town with a disproportionate amount of murders, nice main characters, and food (preferably with crafts)). It was an entertaining quick read perfect for the season, and the solution to the mystery was not obvious from the outset. You can also easily follow the plot even if -- like me -- you had not read any of the other books in the series. I liked the characters and set up of this series, but the mystery itself was fairly obvious when the murderer first made his appearance. I imagine that if I had more of a history with this series and the characters I would have enjoyed it more. 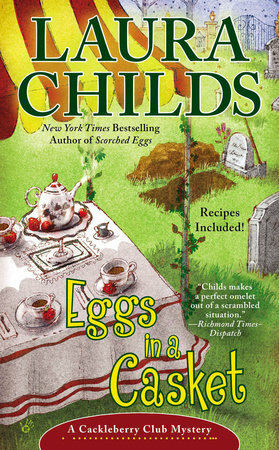 Eggs on Ice is the eighth book in the Cackleberry Club series. This can be read as a standalone. It is a cozy mystery that is an average read. This story had the potential to be better than it ended up being. But somewhere along the way the author failed to connect all the dots. It seemed like the ending was just thrown together without a lot of explanation. 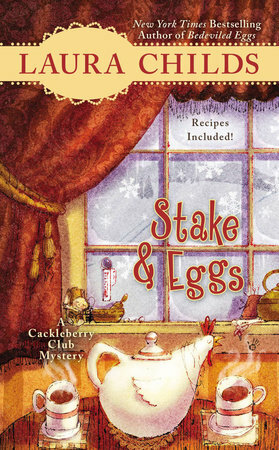 EGGS ON ICE is the first book in the Cackleberry Club Mystery series I’ve read. Even though it’s number eight in the series, I was able to easily get up to speed on the three main characters (Suzanne, Toni, and Petra), the town (Kindred), and the café the main characters co-own. It is holiday time in this installment of the series, and the characters are helping with the town's theatre production of "A Christmas Carol." During dress rehearsal, the actor playing Scrooge (lawyer Allan Sharp), is stabbed to death by a person dressed as the Ghost of Christmas Past. Suzanne tries to catch the killer before he leaves the theatre, but he escapes. As usual in cozy mysteries, she and the other women decide to do some sleuthing of their own to find Allan’s killer. There is a long list of people who had an axe to grind with Allan so there are a lot of suspects. This leaves a lot of red herrings for the reader to sort through to figure out the murderer’s identity. It was a fun, light read – perfect for holiday reading. Disclaimer: I received an advance reading copy through Penguin’s First to Read program. All opinions are my own. Cozy mysteries are not my favorite genre, but being in a holiday spirit I gave it a try. Small town characters doing ordinary things, except for a far fetched murder plot line. Not having read others in this series, I was disappointed at the lack of character development, and saw the killer a mile away. Unless you love this author and series, I would advise you to skip it. This is my second favorite series (after the teashop series) by one of my favorite cozy authors. Whenever a new installment in this wonderful cozy series is published, I usually run right out, snap up a copy, and read it. Fortunately, thanks to First to Read, I was able to acquire a complimentary copy of this terrific 8th installment. This Christmas-themed cozy does not disappoint. Suzanne, occasionally assisted by her fellow Cackleberry Club owners, owners, manages to solve another one. A local theater group is putting on A Christmas Carol, Suzanne, Toni and Petra put on a Christmas Tea, and other holiday goings-on make for an enjoyable holiday cozy, one I'd highly recommend for cozy fans. Another winner from one of the masters of the cozy mystery, Laura Childs. Outstanding. Boy, oh boy. I suspect that I am not a fan of cutesy holiday stories. I didn't enjoy this. I tried. It's a simple read, but almost to simple. I read the first couple of chapters and realized it wasn't for me. I skimmed and then went to the last few pages and felt like I didn't miss a beat. It is Christmas season at Cackleberry Club Cafe. Most everyone in town was in the play Scrooge, when an actor was killed. Suzanne and everyone saw it happen and it was a ghost. Or at least someone dressed up as a ghost. Then Suzanne chases the ghost and almost gets killed herself. I have not read any other books in this series but yet seemed to know the characters. Suzanne works in the cafe but always seems to be investigating murders. She is engaged to Same who works as a Doctor. Her 2 friends are Toni and Petra who also run the cafe. You get to see their friendship and how the people in the town all support each other. Suzanne always seems to be in the wrong place at the wrong time. The police even tell her to stay away from the investigation as well as her fiance. Scrooge murdered by a ghost in front of an audience of “actors.” What better way to open a Christmas mystery? The list of suspects grows as the official police and the amateur sleuths attempt to get to the truth. Suspense-building moments and frightening events keep the reader engaged throughout the book. Having the action take place in the midst of delicious tearoom choices (with recipes included) and creative crafty items adds to the “coziness” of this mystery. An enjoyable read for many reasons. I really wanted to like this book. ...The cliche is an expression, idea, or element of an artistic work which has become overused to the point of losing its original meaning or effect, even to the point of being trite or irritating, the continuous use of the cliche created such a barrier to the story I simply couldn’t finish. Laura Child is a better writer than this, she does not have to be dependent on these cheap devices. I am very aware these “series” are formulaic, but this just shouldn’t have been written. This book was fun to read!!! The characters were fun and easy to follow even if you haven’t read other books in the series. It is an easy read and very enjoyable. I was excited to have the chance to review the latest in the Cackleberry Club series. Previously I have only read the first entry in the series so I was a bit concerned about keeping up with all the relationships. That didn't prove to be a problem at all. I enjoyed the story setting of a small town, little theater production of A Christmas Carol and looked forward to a cute holiday mystery. But I just couldn't enjoy it. I found the characters to be cliched and uninteresting and the story to be slow. Perhaps it was just my mood, but it was a struggle to finish. I wanted to like it, perhaps this series is just not for me. Thank you for the opportunity to review this book. 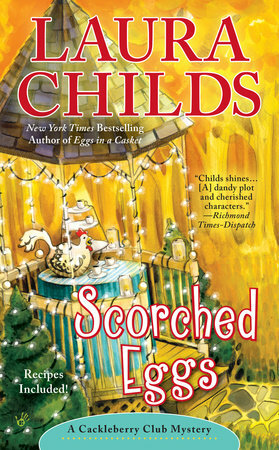 I received an ARC of 'Eggs on Ice by Laura Childs from the First to Read program for free in exchange for my review. This is my first Laura Childs book, however the book works as a standalone. The book is a very light read with one of the main characters, Suzanne, asking questions and putting together a picture of what happened. The story's background of the Cackleberry Club and the small town where it is located, help to make the overall story an enjoyable read and in that aspect, having read earlier books in the series would help. Still it is a fun read that can be enjoyed by anyone. This was the first book I've read in this series . I was concerned I might not be able to make sense of the relationship between the character but that was not the case. It was a very good read. The content was light, the characters were fun. I'm looking forward to reading the other books in this series. I thoroughly enjoyed this book, the guessing and light action that kept it moving- and kept me reading. It's the first book in the Cackleberry series that I've read ( and it definitely won't be the last). The author, Laura Childs keeps you engaged from the opening chapter and kicks up quite an appetite for the delicious treats the characters, Suzanne and Petra prepare at home and in their cafe. We follow Suzanne and Toni as they make the connections that lead to the solving of the mystery case at hand. The consolation for this is that the author shares some recipes that will satisfy your hunger, at the end. What I loved most about this book is how the author captured the atmosphere of a small town and how the characters weren't cringe-worthy, on the contrary, each character that I met was delightful. I stand behind this book as an enjoyable read, especially over the upcoming holidays. This is the first I've read in the series but it works without having any background on the characters. The murder comes early in the book and the story is filled with clues and some misdirection that kept me guessing. All in all a delightful read. I look forward to reading more from the series. I received an advance copy of this book in exchange for an honest review. This was my first read in the Cackleberry series and it's to slip right into the story without having to have read the others. A fun read that would be perfect for reading on a snowy morning with pastries and a hot cup of tea. I would highly recommend the pastries and tea because this book certainly made me hungry and the recipes at the back made me so excited. The story itself is fun and full of twists and turns. It kept me guessing until the very end, certain I knew who had done to be full of doubt later. The characters are fun and entertaining. And the world makes me want to curl up in a bed and breakfast in a small town and just enjoy some simplicity, preferably without the murder. This is first of the cozy series I have read. It was definitely cozy and fast moving. I enjoyed all the characters and the plot. The author kept me guessing until the end. Thank you for the opportunity to read it. This a great little cozy. It's the eight in the series but the first I have read and I very easily slipped right into the characters and their town. The murder happened on page 6! Woo Hoo - that's how I like my cozies to start. Out of the gate, running full speed. The characters are really very likable and the restaurant they run is able to keep the dialogue and information flowing. This is my second book from this author and I am definitely interested in reading more. This new addition to the Cackleberry Club series has Suzanne rehearsing the Christmas Carol play with the Kindred Players when the Ghost exists the stage leaving behind a murdered Scrooge. As Sheriff Doogie starts to investigate Suzanne becomes involved by helping a friend of a friend. It seems that a number of people disliked Allen Sharpe but when a suspect is murdered, Suzanne is put into harms way. An entertaining cozy mystery with taste tempting recipes attached. Thank you First-To-Read for this free e-copy of "Eggs On Ice". It's back to Kindred and another adventure with Suzanne, Toni and Petra. Love this series, the characters and the recipes. This one kept me guessing until the very end. Who killed Allen Sharpe??? Eggs on Ice delivers another action packed adventure, fraught with danger, for Suzanne and the gang. Two murders in one week have the town buzzing with speculation while Suzanne and Toni in tow conduct their own amateur sleuthing. My favorite character is Petra who is placid and the voice of reason. I've enjoyed this series from the beginning. Suzanne is super nosey, but when she and Toni break into a suspect's house, that was a bit much. I thoroughly enjoyed this small town cozy. I liked the characters, and the snooping and action reminded me of the Nancy Drew books I used to love as a girl. The snow and wintery weather conditions added a nice atmosphere to the story as well. I would definitely read more of this series. This is the first book I’ve read by this author. It is definitely the kind of book I enjoy reading but there was something missing. It took me longer than normal to read because it just didn’t grab my attention and make me want to see what happens next. This was my first read in the Cackleberry series and I won’t be reading any more. The writing was mediocre, several of the characters (including the best friend, Toni) were caricatures, and the love interest, Sam, only seems interested in being fed by Suzanne. I’m serious. The adult man can’t seem to feed himself and basically spends all his time with Suzanne trying to get her to cook for him. The investigating was meh, with Suzanne not even finding out for herself who the murderer was - only realizing once the murderer makes an attempt on her life. In fact, we’re never really told why the murders happened. Suzanne and Toni are working at being stagehands for the local production of A Christmas Carol when the fellow playing Scrooge, attorney Allan Sharp, is literally murdered by the ghost in one of the scenes. Suzanne is the only one who realizes what happened and chases the ghost only to be threatened by whoever is hiding under the costume. And so, the 8th adventure in the Cackleberry Club Mysteries begins. As usual, Suzanne and Toni begin investigating, especially since Amber Payson, a friend of Missy Langston, prevails upon amateur sleuth Suzanne for help. Since it turns out that Sharp was an unpopular guy, the list of additional suspects grows. Suzanne and Toni, along with Petra, own and operate the Cackleberry Club Cafe, where they hear all the local gossip and keep on top of what’s happening, which is handy when they decide to find out who murdered Sharp. Author Laura Childs writes engaging mysteries with lots of red herrings, twists and unexpected developments. For instance, the play’s director Teddy Hardwick is a serious suspect until he is murdered. Complications and distractions abound. The pace of the story is steady, and the characters well developed. Dialogue is realistic, relationships feel natural. Ms. Childs’ novels are delightful reads, full of charming folks at home in Kindred. Suzanne, co-owner of the Cackleberry Club Cafe´, in Kindred, Minnesota, is part of a theater group putting on A Christmas Carol. But when their Scrooge - attorney Allen Sharpe - is murdered by the Ghost of Christmas Past (or someone pretending to be so), it's a race to find a murderer that no one has seen. When she's later approached by a young woman named Amber who's asking for help, she's surprised. It seems Suzanne's friend has sent Amber to her because she's the one that Sheriff Doogie has in mind for the murder, but Amber insists she's innocent. Suzanne doesn't know her at all, and wants to believe the best, but she isn't sure. Still, with her curious nature she can't help but wonder who not only killed Allen, but threatened her with the same knife. So she sets about looking into the investigation herself, even enlisting the help of her friend Toni. But then the stakes are raised at a seemingly harmless endeavor, and now Suzanne knows she's also on the killer's radar. But can Doogie - or Suzanne - find a killer before he manages to finish her off?... This is the eighth book in the Cackleberry Club Mysteries, so there isn't a lot of background on the characters for those who haven't read the previous in the series, but there is enough explanation as the book progresses that it shouldn't leave anyone in the dark, either. While I knew the identity of the killer early on I was interested to find out how Suzanne would come to the same conclusion. The clues weren't overt, but they weren't hidden, either. There wasn't tons of action involved, it was basically Suzanne going about her daily life and asking questions in the process. She's not invasive, and is never get-up-in-your-face about it, which I enjoyed. She does have her own ideas about the killer and several suspects, yet when she tries to veer away from Doogie's insistence that Amber might very well be the killer, something sort of pulls her back in that direction, which confuses her. Add to this the fact that Toni's almost-ex-husband Junior has had his trailer blown up and now he's temporarily living with her; while he's pretty much a neer-do-well with the brains of a squirrel (and I'm giving him too much credit here as squirrels can be intelligent), but his heart is always in the right place. It's an interesting subplot. There was also a few things that seemed odd at best - a fashion show at a Christmas tea? Who would do that? What about women who don't care for fashion (like myself) but would rather just have a nice tea - I would find it out of place and distracting from what is supposed to be a seasonal event. In the end, there was a bit of suspenseful action which was nice, and it gave the tale a little oomph that was needed. When all came together I felt that it was rather pat, since we weren't given any explanation of why things happened the way they did; and I would have liked to have an extra chapter to explain everything; it felt rushed to me (I have put the major spoiler on Goodreads where it is hidden; I did not feel the need to also put it here). All in all, a decent entry in the series. Recommended. This was my first book in the Cackleberry Series that I have read but I really enjoyed it. It's a nice light cozy Christmas mystery. I really like cozy mysteries, especially with holidays mixed in. This is a book that I got into easily despite not having read the rest in the series. I do plan on reading the rest and catching up. The characters are likeable. The story line is intriguing and kept me guessing. I loved this book! My first book in this series and I’m hooked! Thankfully, even though it is in the middle of a series, it can stand alone. You don’t have to read the other 6 books before this one to understand what is going on. The loveable Suzanne and her feisty sidekick, Toni, get into all sorts of mischief in this fun, nail bitting, page turning mystery. A must read! Oh, and the recipes are a must try as well! Delicious! I found this to be a cute story. There wasn't anything surprising here. The characters who were supposed to be likable were, those that were supposed to be annoying were as well, some of them were more than 2 dimensional. The mystery made sense and the ending was interesting. While not a series I will seek out, I would read another from it if I happen across it. It's the third Laura Childs book I read and I still find her work mediocre, although this one was a bit better than the others. I keep reading them because the first chapter included at the end of the previous book always seems great. This plot seemed the least outlandish, possibly because this is number 8 in the series and I think her other two series have nearly 20 books each. Her characterization worked a little better in this one too. Suzanne, Sam, Doogie, and Jakes are all fairly believable. Toni, Junior, and Petra are a bit ridiculous but don't go too far. The plot of the murder was well structured and the death scene way very well done. I wish I lived in a town with as many events as this one. In this book alone, there was a community theater production, a wine and cheese event, a Christmas tea (which included a fashion show? ), and a cross-country ski loop fundraiser. As a long time follower of the Tea Shop Mysteries, it is only recently that I have read the Scrapbooking and Cackleberry Club series. I found this book of the series delightful! It is full of interesting characters and the plot keeps you interested throughout the storyline. I am glad I had an opportunity to sample and I will be looking for more of Laura Childs books in the future. This is the first book I've read by Laura Childs. I enjoyed it the story and the characters. I'll be reading more from this author for sure. I just happened to catch book #7 at the library and once I saw that I could get this book at First to read I made sure that I got a guaranteed copy because I wanted to read this one as well. I like the writing style and the shenanigans the ladies at the Cackleberry club get into. Although if I was to pick this one up without having read the other one I think I would have been able to keep up and not be lost. Allen Sharpe is a lawyer in town and he is not well liked by anyone even the sleazy mayor and they used to be very close. During the play practice of the "Christmas Carol" Allen dressed as Scrooge is murdered by the ghost. Suzanne (co-owner of the Cackleberry club) chases down the ghost through the theater and gets threatened with a knife herself. Suzanne known for her curiosity and tendency to get herself involved with murders and events is approached by one of the main suspects Amber to help her get out of trouble. Sam Suzanne's fiance and one of the town's doctors trys to convince her not to get involved. She does not listen and ends up getting into life threatening danger more than once. There are several mysteries to solve in this story. Looking forward to the next book. I received this book to read for free from First to read in exchange for an honest review. The opinions in this review are 100% my own. Allan Sharpe is the perfect Scrooge. Too perfect. Hardly anyone likes him. During the "A Christmas Carol" rehearsal, he is boldly stabbed to death in front of his fellow actors and actresses by the Ghost of Christmas Past. Kindred's most meddlesome inhabitant, who co-owns the Book Nook, Knitting Nest, and Cackleberry Club cafe, Suzanne Dietz, chases after the ghost but loses him. As Sheriff Roy Doogie investigates, the list of suspects gets longer and longer. Sharpe was a scummy lawyer, so everyone has a motive for wanting him dead. Those who seem most likely are, the secretary whom Sharpe sexually harassed, the new assistant preacher, and his unhappy law partner. Suzanne tries to stay out of it but she keeps getting yanked back in much to Sheriff Doogie's chagrin. The race is on to catch a killer before he makes a ba humbug out of Christmas. 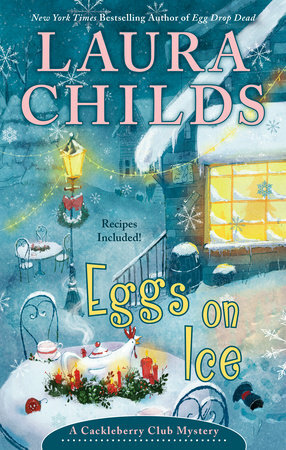 "Eggs on Ice" is a cute little, Christmas mystery that I thoroughly enjoyed. All of the characters are likable and have the most adorable way of talking (holy cats!). Ms Childs brought the small town to vivid life. I so want to live there! And it put me in the mood for Christmas. This is the ninth book in the series, but I didn't feel lost while reading it. The mystery was well-thought out and though I had an idea who the killer might be I still had plenty of doubt that kept me guessing. With a mixture of charm and intrigue, "Eggs on Ice" delivers a holiday special that's sure to please. This is my first Cackleberry Club read (this is the 9th book in the series!) and though I wish I started with the first one, I don't feel left out. This is a fun read, I like how Suzanne's logic, Toni's sass, and Petra's morality and creativity balance each other. Being at the cafe is so home-y and hygge its like vacationing in a picturisque town. Though I kind of figured out right away who might have done it (without the why), the red herrings might sway you to think otherwise. A cozy mystery to hibernate with this winter. Thanks First to Read for the opportunity!